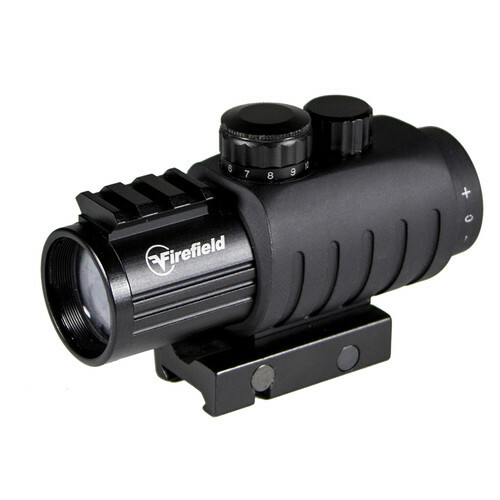 The 3x30 Prismatic Sight with Red-Black Circle Dot Reticle, 1.5x Lens Converter from FireField is a prismatic sight with a red-black circle dot reticle, eleven reticle brightness levels, and is free of parallax at 20 yards. The sight features 3x magnification, 30mm objective diameter, fully multi-coated otpics, and Bak-4 prisms. If you need additional magnification the included 1.5x lens converter can be attached to the sight and increase total magnification to 4.5x. To help you compensate for wind and projectile motion, the sight has a 160 MOA windage and elevation adjustment range with 1/4 MOA per click. The matte black aluminum housing with rubber armoring is weatherproof, nitrogen-purged fogproof, and fits on a Picatinny or Weaver mount. To help you mount additional accessories on the top of the sight, it has an integrated short Weaver rail. Also included with the sight is one CR1620 battery, protective objective caps, and a lens cloth.